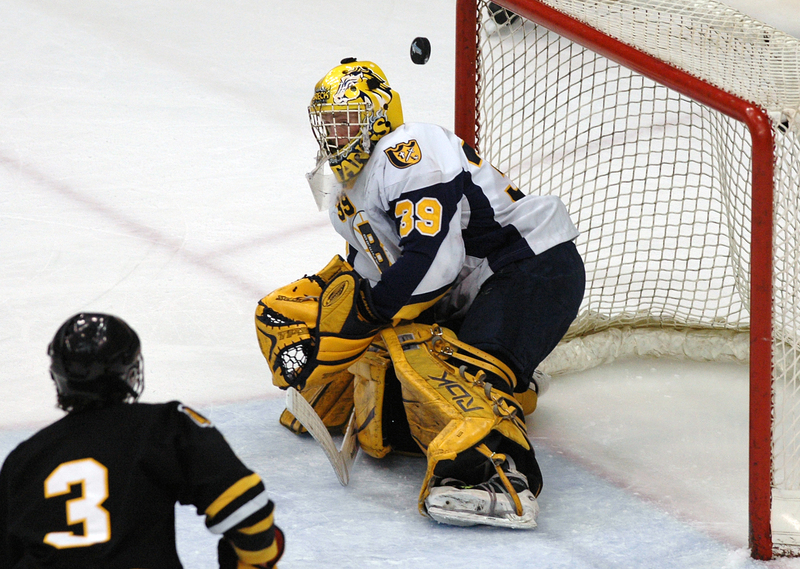 Hard hitting, hooking and slashing, clutching and grabbing – all of that rough stuff fits Breck star Mike Morin’s game about as well as a hard hat on a pastry chef. 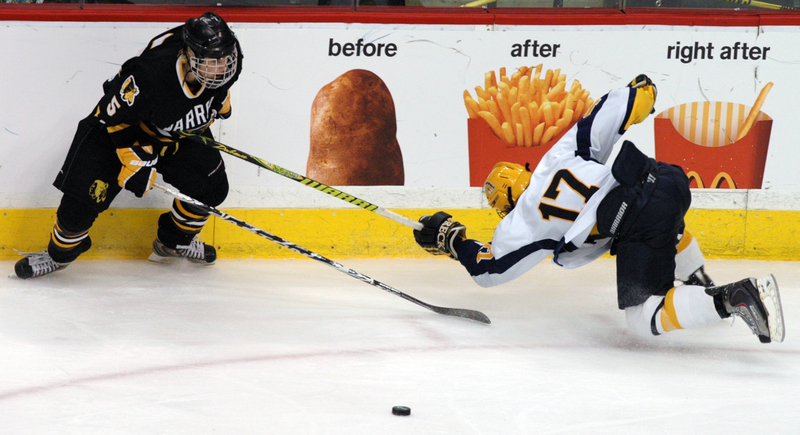 Funny though, for a guy who was out of his element during the Mustangs’ 4-2 state Class A semifinal victory over bruising Warroad on Friday, March 12, at the Xcel Energy Center in St. Paul, Morin looked perfectly at ease. 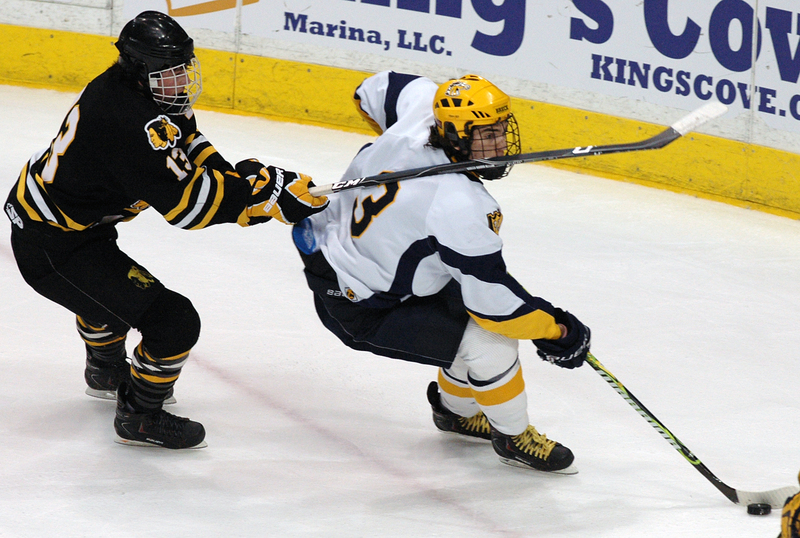 He scored twice in the second period and added an assist to power the defending state champion Mustangs (28-2-0) past the Warriors (25-5-0) in a rematch of last year’s state title game. 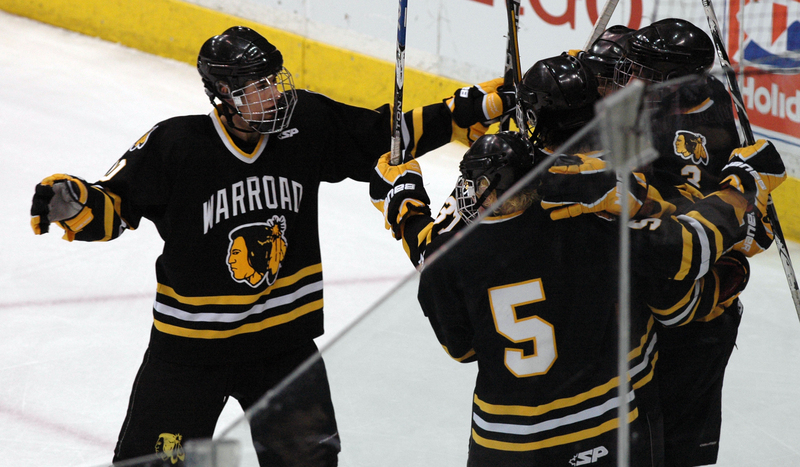 Warroad coach Albert Hasbargen said this is the most physical Warriors team he as ever coached. 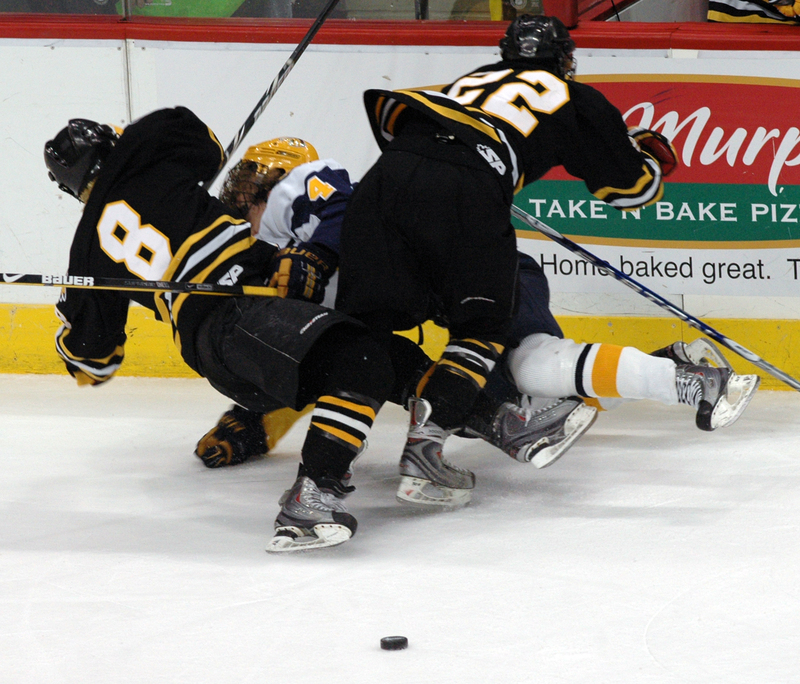 Factor in that Warroad has some size – eight players on the Warriors’ roster are 6-foot or taller – and the stinging memory of last year’s 7-3 loss to Breck, and it figured the game would get physical. 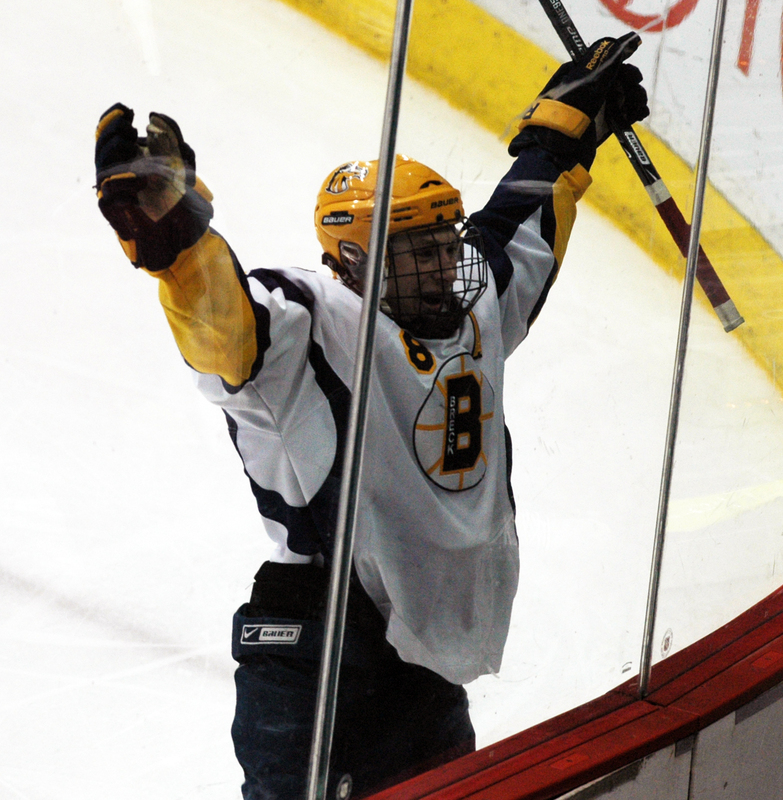 Sure enough, Warroad finished with 20 quality body checks compared to five for Breck. Yeah, Breck can deal with the opportunity to become the Class A team to repeat as champion since the A and AA divisions were formed in 1994. The last team in any class to win consecutive titles was Bloomington Jefferson, which won three straight in 1992-94. 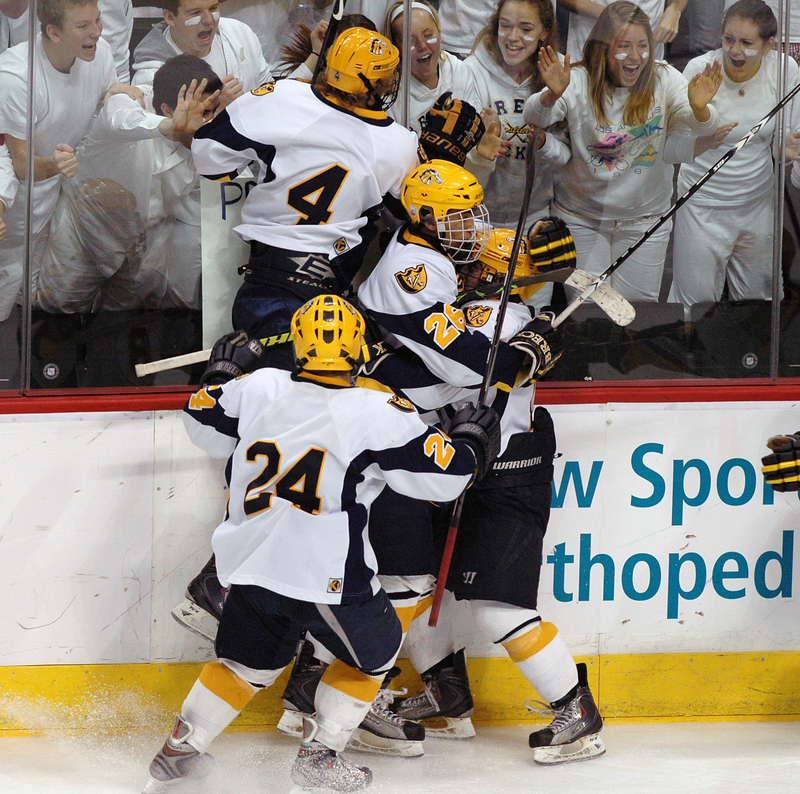 To win that second straight title, the Mustangs will have to get past Hermantown, which outlasted Mahtomedi 7-6 in overtime in an electrifying matchup that had the building buzzing for hours afterward and will be remembered as one of the greatest games in tournament history. 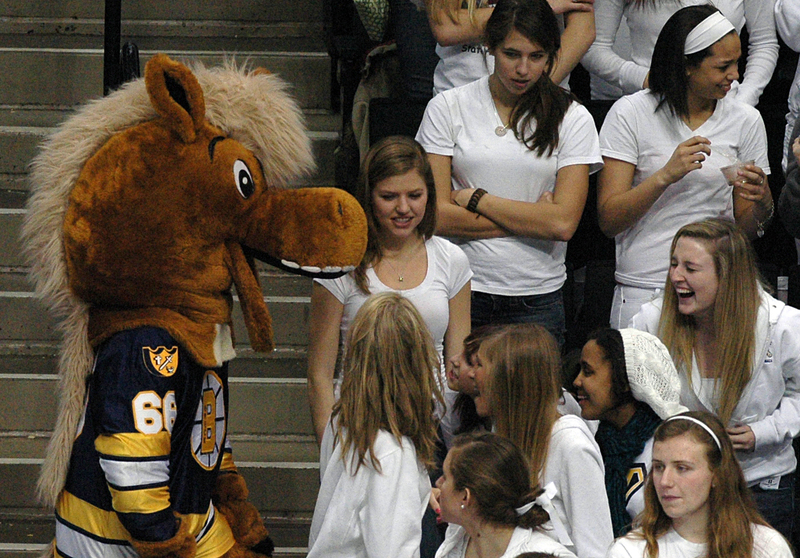 Although Morin might not necessarily agree with that last statement, Breck senior Riley Borer most assuredly would. 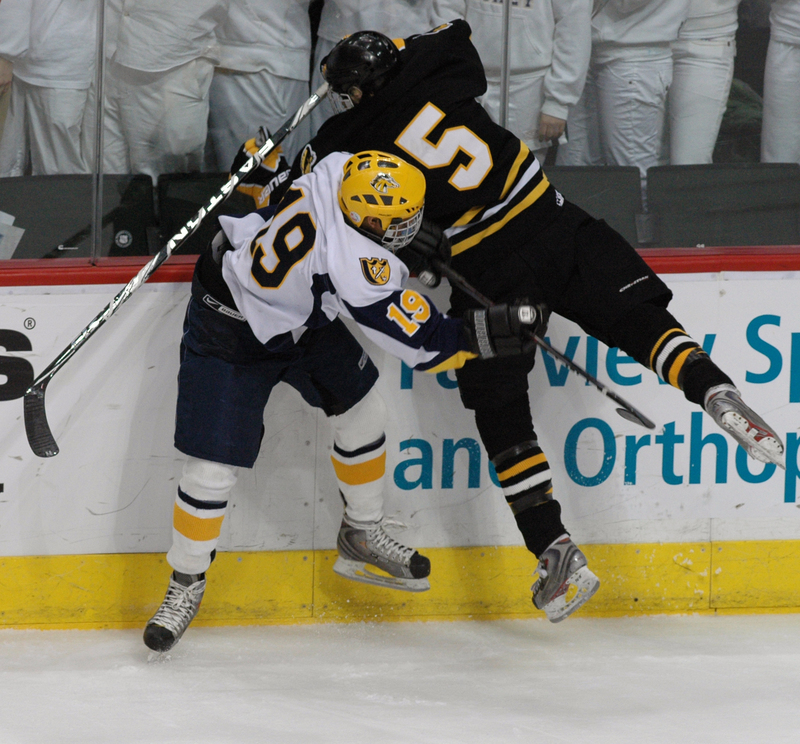 Borer had a goal and two assists for the Mustangs in their latest win over Warroad and had no problem with the rough stuff. While Borer says he’s merely the guy who throws his body around and gets the puck to Morin and Fulton, there’s some skill to his game, too. 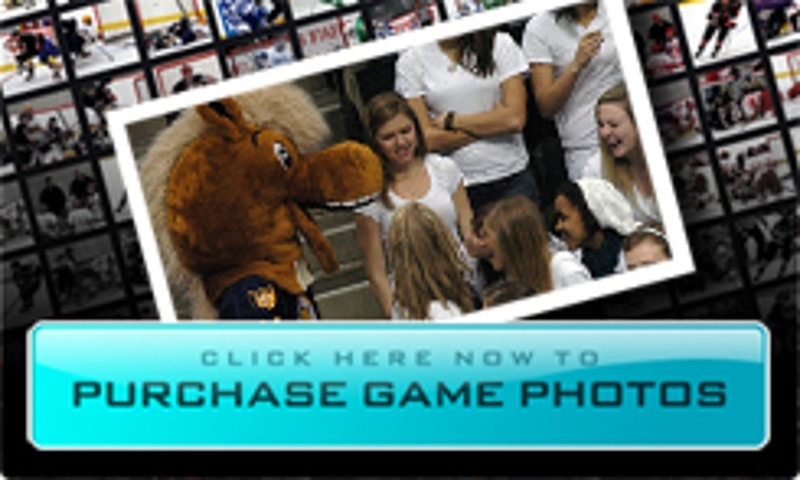 He has 20 goals and 43 assists this and was, after all, the one who found Morin streaking through the slot on the Mustangs’ third goal. 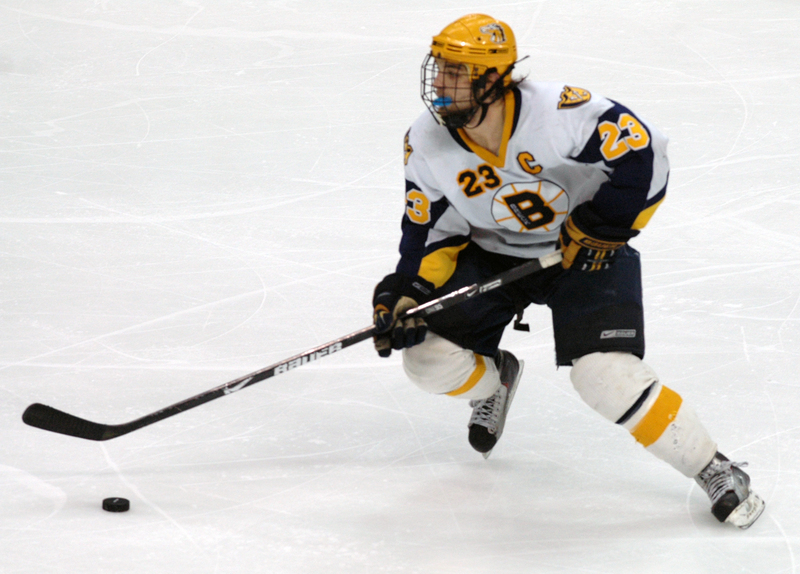 Mustangs senior and Colorado College recruit scored twice in the second period as Breck turned a 1-0 deficit into a 3-1 advantage. 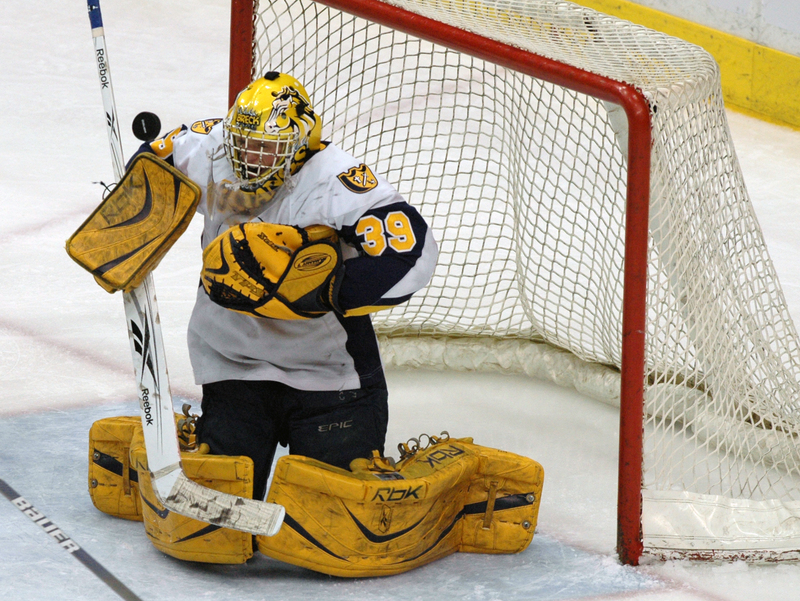 Morin’s second goal came on a nice give-and-go with Riley Borer, as the Morin took the return pass in full stride in the slot and fired a shot past Warroad goaltender Andy Foster. 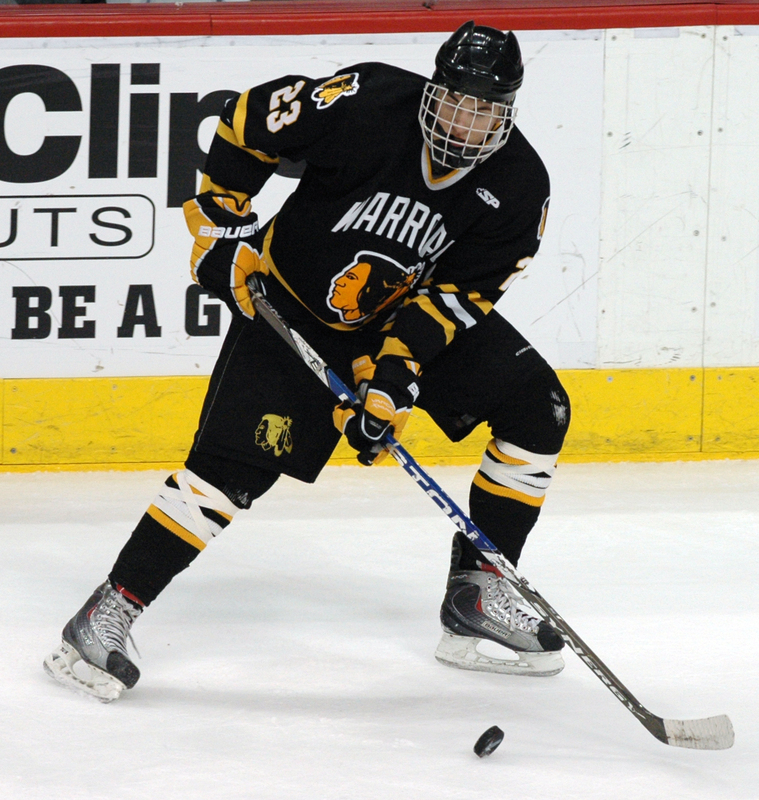 Warriors senior, a Mr. Hockey finalist and North Dakota recruit, scored the opening goal by batting the puck out of midair, then added another 10:20 into the third to pull Warriors to within 4-2. 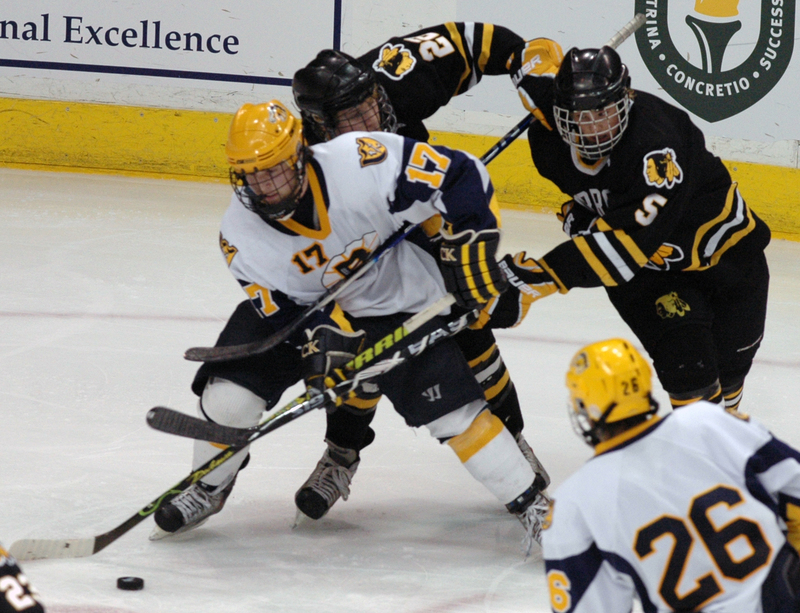 The senior forward scored just 33 seconds into the third period putting the Mustangs ahead 4-1 and making a Warroad comeback highly improbable. 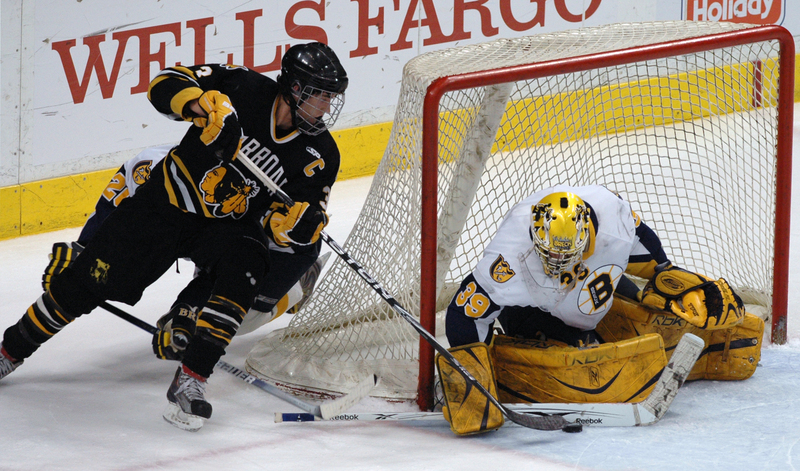 After Friday’s 4-2 loss to Breck, Warroad coach Albert Hasbargen was asked where his Mr. Hockey finalist, Brock Nelson, ranks among the great players Warroad has produced over the years. “He’s right up there. I was just a young boy watching Henry (Boucha), but I got to see some of the other ones. 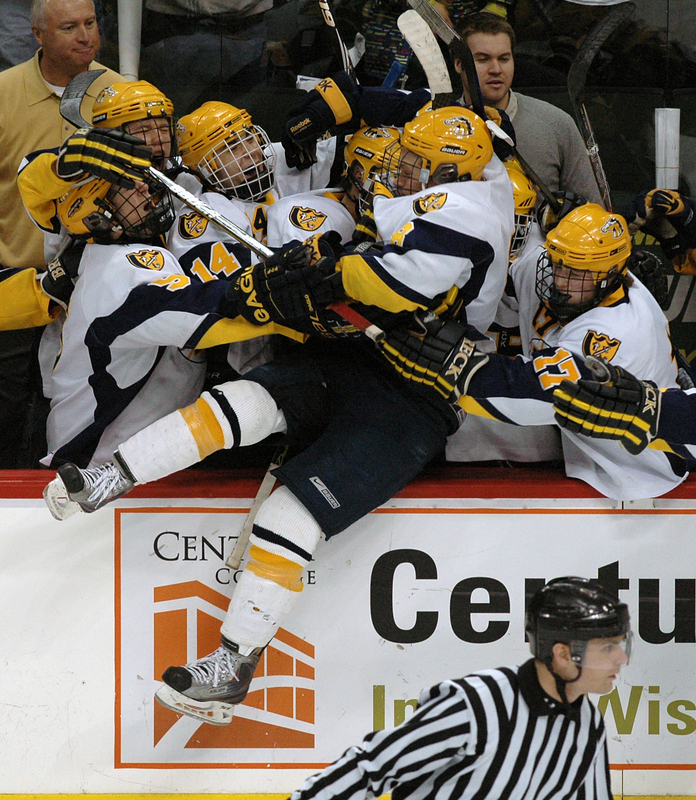 I coached (former Warriors star and current St. Louis Blues forward) T.J. Oshie,” Hasbargen said. 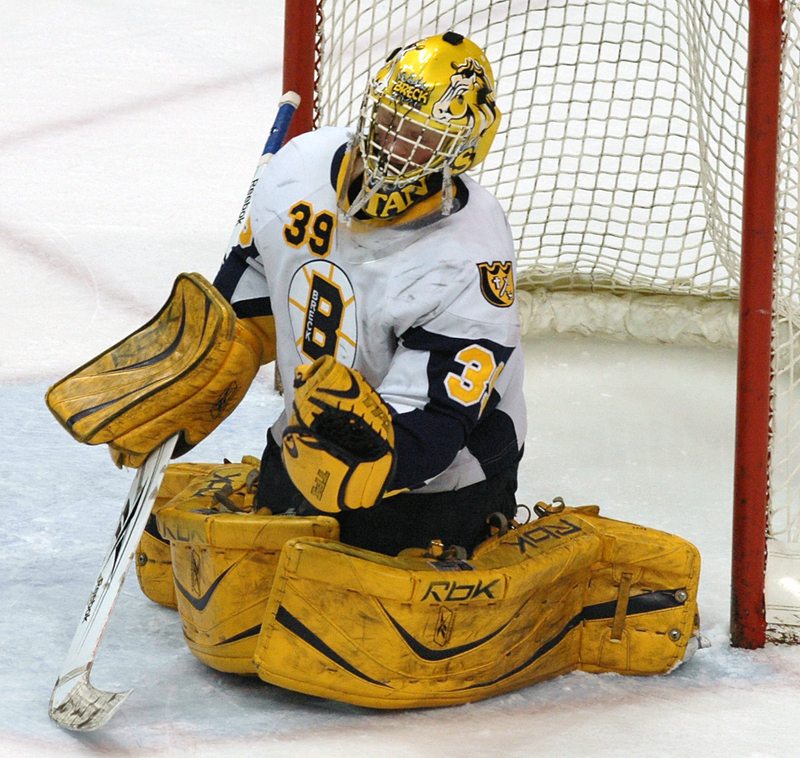 “This young man does things with pucks that other kids just dream about. He’s got some special skills and some special talent. 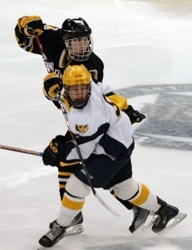 You are going to see him in the big leagues in the future for sure.” Nelson scored both Warroad goals in the loss and now has 51 goals and 41 assists this season. 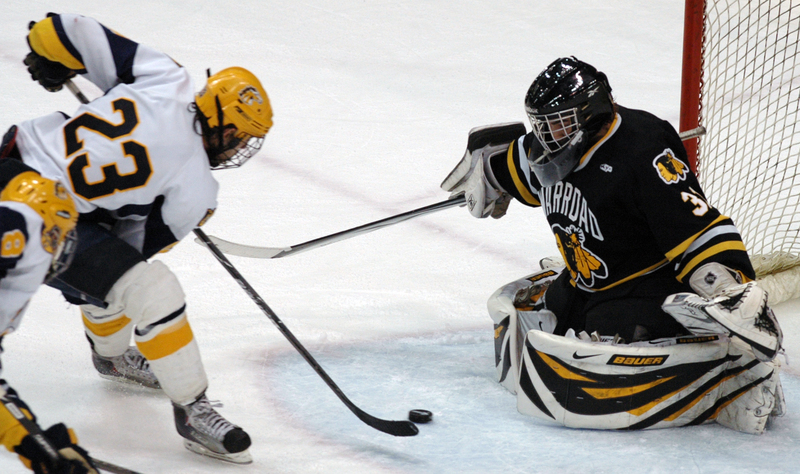 After a fast-paced, back-and-forth first period the pace slowed to a crawl in the second, at least for Warroad. 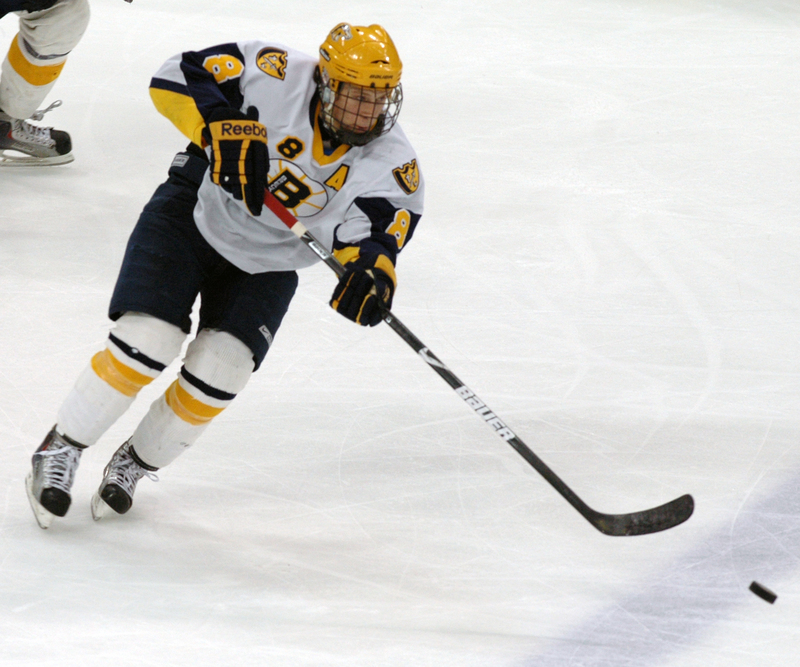 The Warriors had just three shots and precious few scoring chances as they spent most of the period attempting to defend onrushing Mustangs forwards. 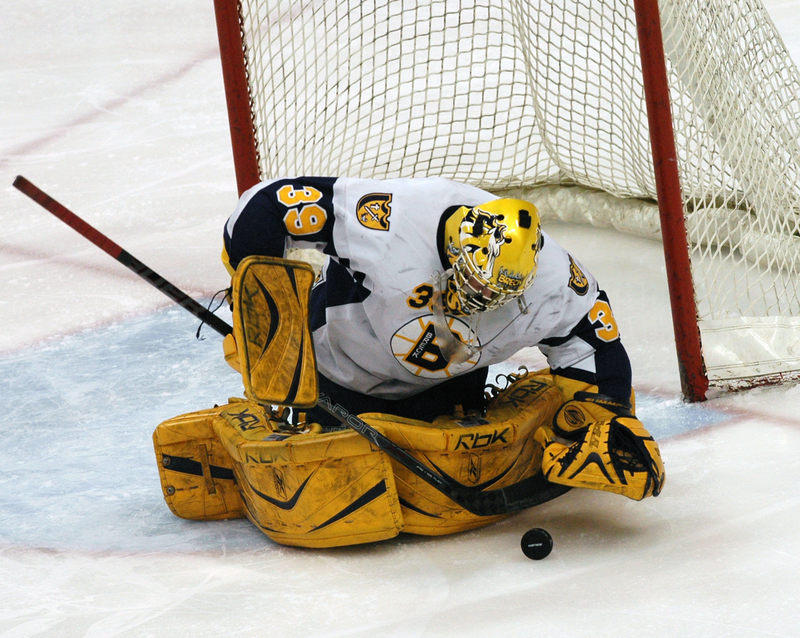 Breck had 13 shots, in the second, scoring on three of them, two of the goals coming from Mike Morin. 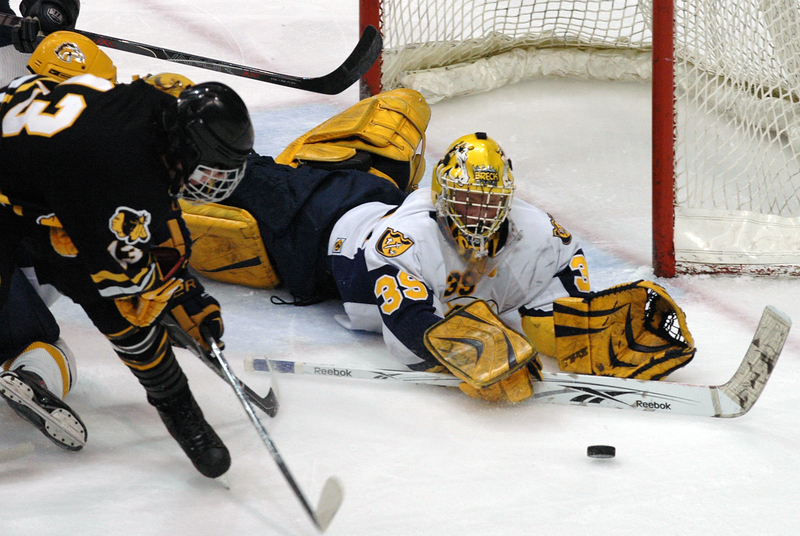 Warroad sophomore goaltender Andy Foster entered the game having shut out Thief River Falls in the Section 8A finals and Rochester Lourdes in the state Class A quarterfinals. 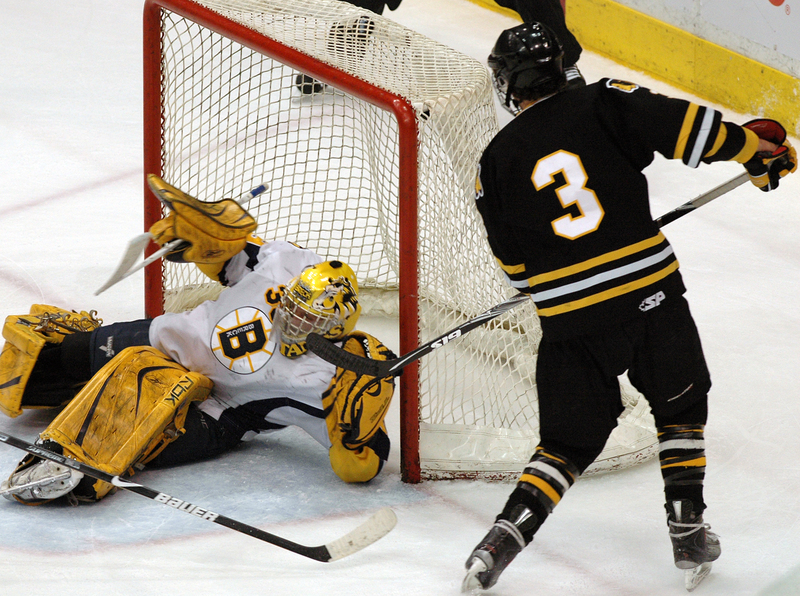 Foster's streak reached 133 minutes, 42 seconds before Breck's Mike Morin scored early in the second period. 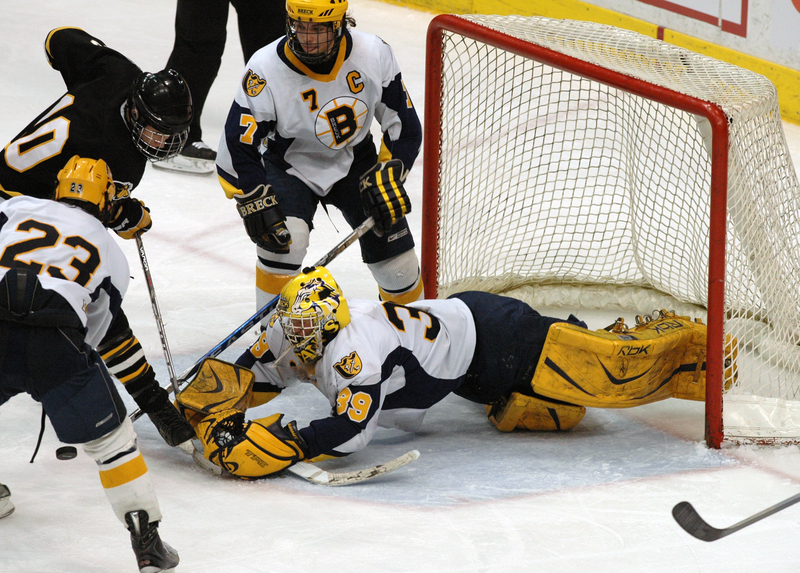 Prior to the goal, Foster hadn’t been scored upon since Kittson Central’s Craig Lindegard slipped one through early in the third period of the Section 8A semifinals back on Feb. 27.